Ideal minimum ground clearance for a ground effects floor? 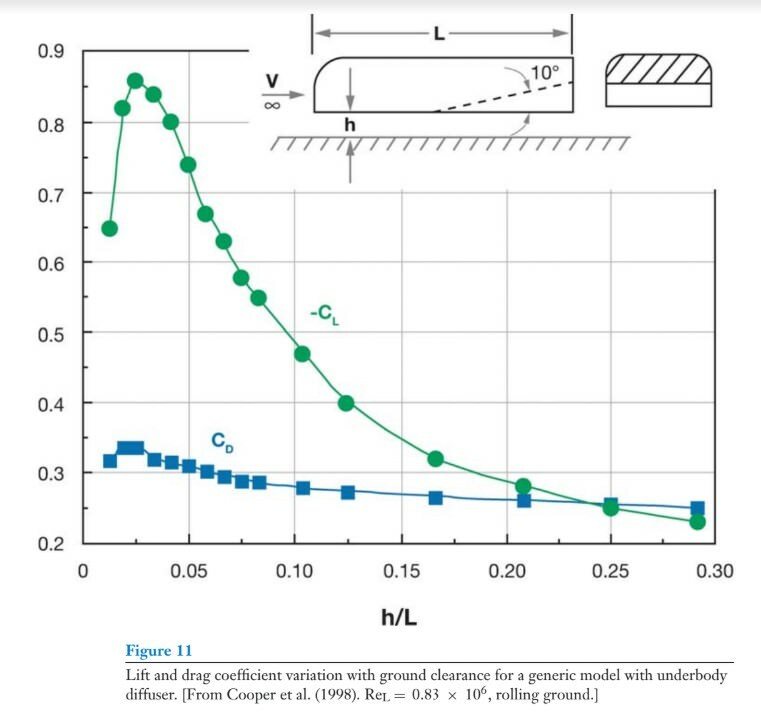 I notice that Katz quotes Cooper who published a plot showing the optimal downforce is produced at a ground clearance to chord (length) is 0.03 for a body with a 10 degree diffuser at Re=830,000, furthermore the downforce drops dramatically as that ground clearance to chord reduces further. That finding would suggest the minimum ground clearance for a ground effects underbody should be around 9cm for a 3m long ground effects floor. Yet, the current Formula 2 car, the Panoz DP01 champcar (and so on) seem to follow the the F1 cars of the 1980s and instead operate on the principle of having the minimum ground clearence as close to the ground as possible? I.e., a floor that is flat at it's lowest point, and not with a "tunnel" to increase the throat area at the point of minimum area, even though the DP01 and F2 cars were/are not restricted by regulation to mandate a flat floor. Whether this was just a quick and dirty, since the rules mandate an inside step and thus more minimum ground clearance anyway, or whether such a step-up and step-down is more broadly beneficial I don't know. 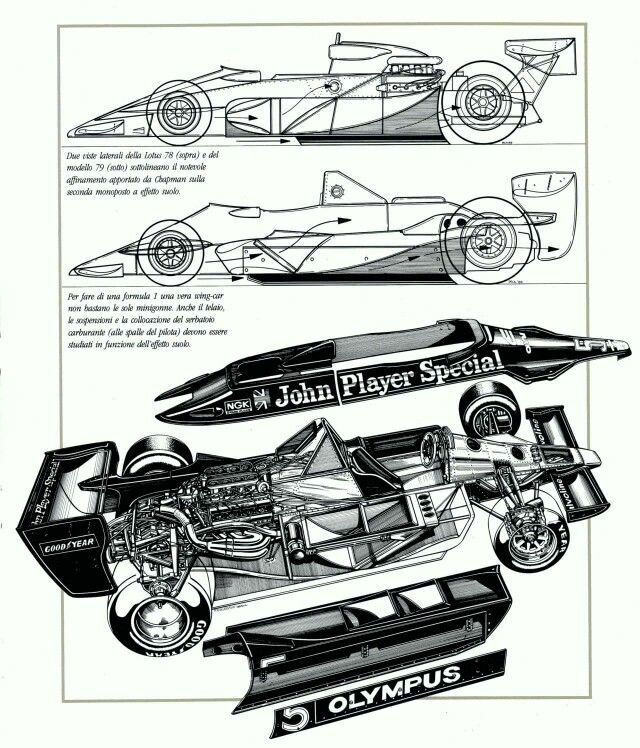 The Lotus 79 increased the area of floor low to the ground over the Lotus 78. It's clearly beneficial to have the lower pressure over a large area, and the 79's designers' seem to think it best the minimum ground clearance of the venturi tunnel should be just as low as the driver and engine (the lowest point was as low as practical really, even if there were further skirts that extended all the way down to the ground itself). I was wondering conceptually, what the design from first principles should be (short of breaking out the CFD or a wind tunnel to work it out!)? Should there be a channel well above the ground to reduce tendency to stall, or is the lowest pressure achieved by having the lowest point of the floor/venturi as close to the ground as possible ? I guess the question is whether having more ground clearance to have more mass flow will actually reduce the pressure under the floor or not, and what is actually optimal.. The Swift Formula Nippon car is potentially an example of the former though I haven't been able to find a good picture of the exact shape of the floor. It seems (perhaps) to have step up and then a step down at the outside for a slightly higher minimum ground clearence of it's venturi tunnels. Newey's Aston Martin Valkyrie seems to another that operates on having a substantial amount of ground clearance at the lowest point of the venturi tunnels. Seemingly it has around 20-30cm high channels around the outside of the driver compartment that then feed into the rear diffuser. Presumably with this larger ground clearance, and running lots of massflow through the car to get the low pressure, the down force is not so sensitive to ride height. Yet no (open reg, spec series) race cars seem to be designed this way!? So much ground clearance at the lowest point of the Valkyrie's venturi tunnels! If it's not too much to ask, I am curious about the entry ramp to the floor too. I would have thought a nice contraction (like in a wind tunnel) would be good^, plus the vortex generators. Yet that seems to be rarely used on free regulation cars (like F2). 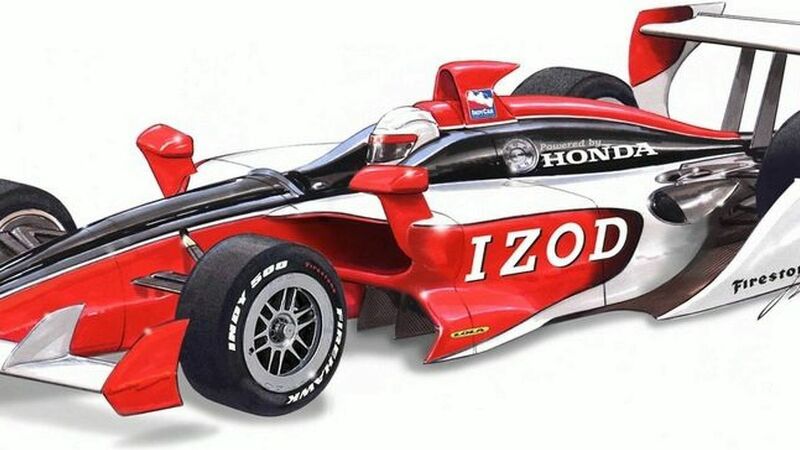 Below is the entry solution to floor on Lola's concept ground effects based Indycar.. There is plenty of intake area for the floor here, albeit no doubt with large vortex generator strakes like the Panoz to direct most of the gobbled up air out to the side and NOT underneath! By contrast to the Lola, the design of the entry to the floor on mid-2000s F1 cars is so simple (as below). You had your splitter, your bargeboards and a nice simple hole between the splitter and start of the floor (behind the bargeboard) to direct air from the splitter to underneath the floor. Is the mid-2000s F1 design for the entry ground effects particularly good or bad (it must be a good solution right, they were such quick cars, and no wonder the likes of the F2 choose to use this type of layout despite no regulations compelling them too? ). Thanks for your help! Maybe I am thinking too much about trying to conceptualise things by thought experiments and rules-of-thumb, and maybe it's impossible to conceptualise a half-decent design for a unregulated ground effects floor without hard data -- I do apologise! Last edited by JordanMugen on Sat Dec 08, 2018 6:40 pm, edited 1 time in total. Re: Ideal minimum ground clearance for a ground effects floor? There's no such thing as an ideal ground clearance for all cars. In your bluff body example the downforce at peak is just that - a peak, i.e. move the car from the optimal height then downforce is significantly reduced. Producing downforce from an underbody isn't the hard bit - producing a consistently high downforce from the floor is where the work goes in. The skirts used in the Pirelli tyre testing was because of an FIA ruling which meant teams couldn't run with solutions which could go on the 2017 car - so the skirt was a quick way of adding some downforce without running foul of the FIA. The F2 car has a stepped floor, likewise the original GP2 - this is an FIA rule to prevent sudden drops in downforce since 1995, i.e. the floor duct is never totally choked. A lot of series copied that rule as a means to limit performance - e.g. Indycar/CART. Indycar and LMP have massive domed skids underneath to both maintain ride height and create some downforce when the car is sliding side-on. In the case of the Aston Martin, being a road car it has to operate in an environment with speed bumps and potholes, so performance is compromised for function. The F2 car has a stepped floor, likewise the original GP2 - this is an FIA rule to prevent sudden drops in downforce since 1995, i.e. the floor duct is never totally choked. Interesting! Do you suppose the step is quite necessary? Would you choose to put a step-down or skirt on the outside of the stepped floor if you were allowed to (say, designing for a modest budget one-make formula series with no regulations and a goal to match 2017 F1 laptimes with say 1000hp to push the car along, courtesy of an unrestricted version of the AER twin-turbo 4.0L LMP1 V8 -- maybe this goal is not as hard as I think, though I look at F2 cars being 10 seconds a lap slower than F1, Indycar being even slower, and think geese you would really need to pull out all the stops to match F1 performance on a tight budget^ -- exposed wheels of course, for tradition)? ^ Tight budget, hence largely a simple looking car with minimal development time designed largely from first principles (? ), like most of the other spec series cars. 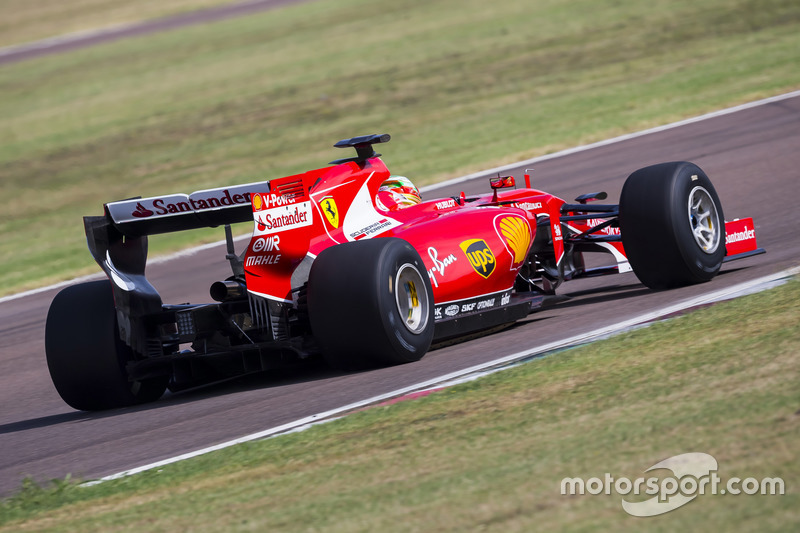 Not something that is necessarily highly fine tuned to extract the last 5 seconds per lap of performance like F1. 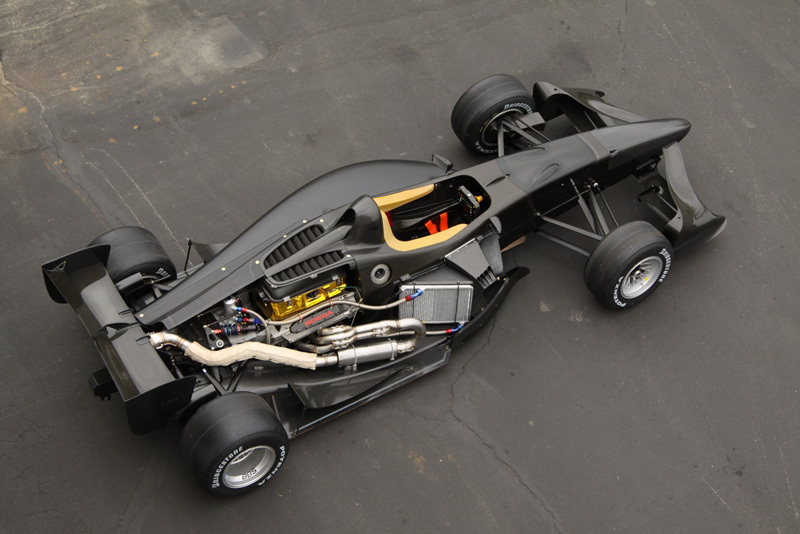 I'm so curious to visualise what such a Formula car would look like! The floor would, perhaps, dominate the layout of the car, but I can't quite visualise what it should look like. I take it you think some kind of relatively low ground clearance solution would best (given that is what everyone else uses), and there is no reason this fictional car should have huge 20cm high tunnels along it (which would be hard to integrate into a formula car)? I think that it is important to note that a diffuser doesn't necessarily need it's expansion to be upwards. The Valkyrie in your post, as well as for example the Empire Wraith rely more on outward expansion. 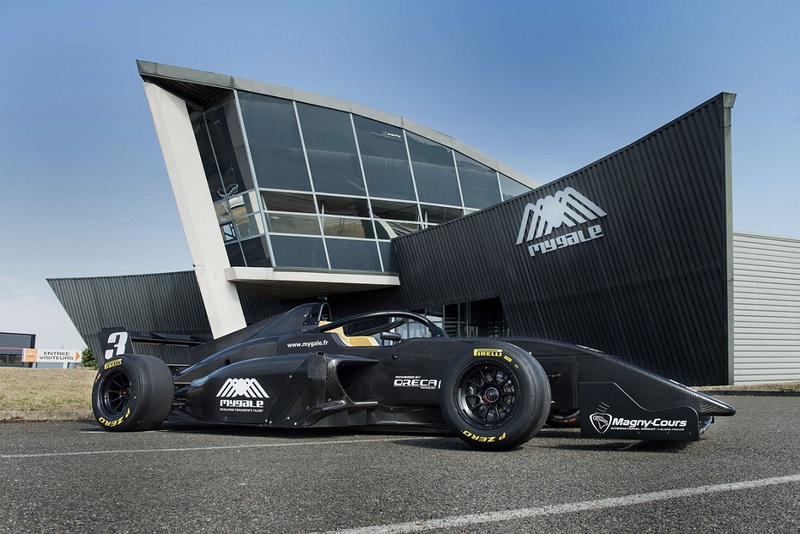 There are a pair of new regional F3 cars from Ligier and Mygale with a more basic version of the Panoz and Swift underbodies - with a bell mouth inlet and a pair of vortex generators. Being FIA spec they both keep the floor step and wooden skid. If I were heading into an open development as you describe this sort of floor would probably be my starting point. If you can keep a skirt on the car that would certainly help to maintain downforce along the length. Active suspension would help to keep the car in the optimal window for downforce. I suppose part of keeping a step in the floor (a lower centre section), if you assume it's not for safety in most race series outside F1, is that it creates 2 distinct ducts which can be controlled to some extent. But you also have to remember a lot of these series are FIA controlled and follow F1 design trends/rules - it's why we're now getting a lot of swept sidepod fronts and angled wing endplates. Great thread and fun to see all of your examples! In Adrian Newey's biography he talks about trying to regain downforce after an FIA rules change. He came up with the exhaust exits being just ahead of the rear tires and pointed outward, which functioned as an air extractor, both negating the tire squirt and actually creating a low pressure area there. He said that trick (Plus all of the other F1 goodness, of course) allowed them to exceed the prior ground effect era downforce levels with essentially the current flat floor + short diffuser. A footnote being that the floor / diffuser exists in an ecosystem of other aero and mechanical systems on the car which are very interlinked. Another unverifiable and possibly spurious data point was a talk by one of the aerodynamicists on the Nissan GTP car that Geoff Brabham drove here in the states. Most of his slides were heavily redacted but he spent a good amount of time talking about the front splitter / tunnel entry issues. Pretty much every contemporary race car of that period had a sharp leading edge at a negative rake angle (think of a wood plane blade) so there were all sorts of aero induced weirdness: Complete tunnel blockages due to suspension movement even with crazy stiff springs, pogo-ing of the front suspension as the splitter would get more and more negative pressure as it got closer and closer to the ground, then it would stall and the front springs would expand with a snap only to repeat, etc. So, on modern cars across almost all classes you now see curved (in section from the side) inlets to the tunnels / floor. Punchline: Cast your gaze to modern WEC cars and even Group C. Most if not all of the Group C tech is completely in the public domain now. Even the WEC car goodies are 'out there' thanks to Porsche leaving the series and then taking their cars all over the world for show and tell. The modern WEC floor is pretty much entirely defined by the regulations. 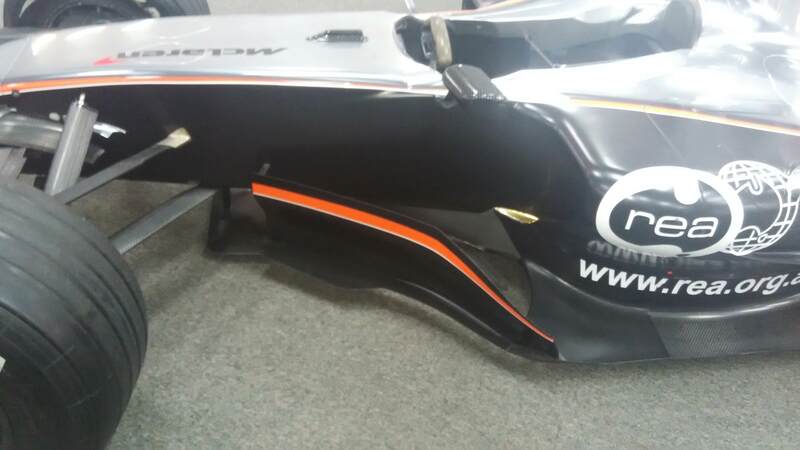 They can play a bit with the length of the rear overhang and the height of the diffuser (up to 200mm) to affect the rate of expansion, then they can choose if/where to put 2 strakes, but beyond that the shape is almost totally spec. I think the 962 lesson is more that they hadn't figured out how deliver high energy air past the front wheels and so they had to compensate. I suspect the more common modern take of dumping front wheel air right in front of the sidepods very significantly impacts how energetic the flow is by the time you get under the driver's feet. Current WEC regs have made the whole question moot because there's an upwards radius where most race other cars would have a side skirt. The FIA kinda freaked out about cars blowing over (who can blame them) and so we got much bigger holes to relieve wheel well pressure, and a floor that doesn't trap air when there's yaw. To the starting question, I'd suggest you would design starting from what sort of courses you expect to encounter. In this hypothetical series we might be a support race for F1 and so we have a very even surface and so our optimum could be lower than otherwise without inducing porpoising. Sarthe and Nordschleife are entirely different beasts and both will be easier to make the most of a lower downforce philosophy than say the Top Gear layout at Dunsfold, where holding onto downforce in the low speed corners is more critical. I think the most salient point of the study at the beginning there is that the ratio is very relevant. A Valkyrie style tunnel is more of a departure from the Lotus 79 than it at first may seem, but it does still treat the ratio of the gap in the throat to total aerodynamic length and rate of change over the whole 'chord' with care. It wouldn't work really if it was slammed to the tarmac since its proper function integrates a certain amount of bleed from the side. Or rather, the footplate vortice generator at the leading edge of the side skirt would have to be retuned for the different ride height. I suspect that cars like the 79 actually had very crummy flow past the throat because the air under the belly would be sucked into the tunnel over a sharp lip and that would easily become turbulent. The formula Nippon package seems like a lot of smart engineering that compensates beautifully for the relative budget deficit vs F1.